The Blue Fox Flash Spinner has a Laser holographic blade and body finish ceates "flash" with this torpedo designed to go deep. 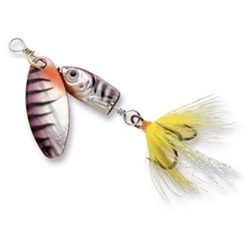 The Flash Spinner has a 30 degree deep depth blade that runs 4 to 5 feet. This Inline Spinner is 3/16oz in weight and has a #2 blade.